Last spring, The Cooper Union made national news when it became the first college in the country to remove gendered signs from all of its bathrooms. Acting President William Mea made the announcement in a college wide email that laid out why it was important to make this change, noting Cooper’s tradition of innovation. “We have always been ahead of our time and we must continue being leaders on issues of social justice.” Bill Mea’s decision came after extensive conversation with students who objected to the school’s bathroom signs, deeming them hostile to transgender people and anyone who doesn’t identify with binary gender categories. A group of about 50 students—cis- and transgender—had been working to change the bathroom signs for two years. Rio Sofia, now a senior in the School of Art, pointed out that violence against transgender people, particularly those who are black, Latino or indigenous, is rampant. Cooper’s de-gendered bathrooms are a simple way to minimize, if only slightly, the sorts of hazards transgender students face on a daily basis. Cooper announced the gender-neutral designation of a few single-occupancy bathrooms in 2014 after the Office of Student Affairs was approached by a group of students who submitted a proposal for such facilities. Bill Mea sent out a schoolwide email a few days after the December 2015 meet-ing, in which he noted that while some people on campus had been thinking about bathroom accessibility for years, for others the questions were new ones. He proposed that the school maintain the all-gender single-occupancy facilities as well as the male and female bathroom designations. But these last would, as he put it, “include signage noting that the restroom is open to anyone who feels that the use of that restroom matches their gender identity and also noting the location of private all-gender restrooms in that building.” He made a point of asking students to contact him to voice their opinions about his proposition. Instead of immediately reacting to the student-improvised signage, Bill Mea left it in place to gauge how the community reacted. What the administration discovered was that few people were uncomfortable with the change, with most choosing to use the same bathrooms they always had. In March 2016, Mea decided that his initial response—to create universal access only for single-occupancy facilities—was a “compromise” he found to be “increas-ingly difficult to reconcile with what I believe to be right and just.” So he declared that all of the school’s bathrooms would remove gender language. It was back to the drawing board for Mindy Lang. This time around, she says, she had a better sense of why students objected to the expression “gender neutral”: it assumed that gender mattered at all. For the new signs, she expanded her research and saw that even the most progressive institutions included the word “gender” in their signs. Instead, she opted for signage that simply described the contents of the room—stalls and urinals, stalls only, or single-occupancy restrooms. Rio Sofia is pleased with the new signs because they don’t impose anyone’s idea of what gender should or shouldn’t be. “Neutrality relies on the logic that there are two poles defining gender: male and female, masculine and feminine,” she says. “It relies on a lot of gender essentialism and erases the experiences of people who are nonbinary or intersex, as well as non-Western and indigenous people whose relationships to gender may be constructed differently.” Sofia believes that the idea of a “unisex” bathroom, while often well intended, depends on the same notions of gender as male and female ones. While the students, faculty and staff had been blasé about the change, the international media took notice with features about Cooper’s facilities in The Chronicle of Higher Education and The Guardian, and especially on various internet discussion spaces such as Reddit. Meanwhile, the rest of the world started catching up to The Cooper Union. In March 2016 Mayor Bill de Blasio ordered that all city-run gendered public bath-rooms guarantee access consistent with an individual’s own gender identity. In May, President Obama ordered that all public school bathrooms also guarantee access according to gender self-identity. 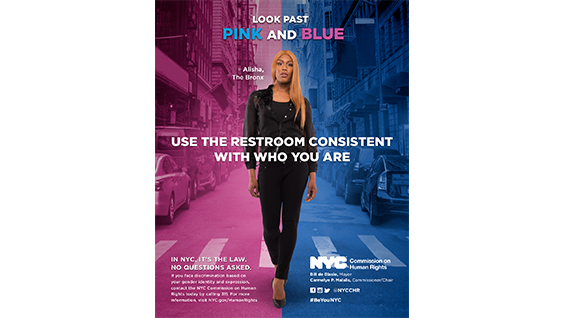 Then in June a New York City bill was passed requiring all single-occupancy bathrooms in all public spaces, including privately owned businesses such as bars and restaurants, remove gender-specific signage.